Although perhaps best known for the acquisition and preservation of Federal Government records, Library and Archives Canada (LAC) also receives private donations from organizations and individuals, and purchases material for its collections. LAC catalogues the material it acquires, and makes it available to researchers, subject to possible access restrictions. The material may consist of records, documents, photographs, paintings, and audio and visual recordings. The media may be paper or electronic, analog or digital. This page lists recently catalogued private donations and purchases of philatelic material that are available for consultation by researchers. Each item includes a reference number that can be used as a search term against the LAC online database (MIKAN) to obtain more information about the material and order it for on-site consultation at LAC facilities in Ottawa. Below the list is a description of how to go about searching for and ordering material for consultation. This list was compiled and distributed by James Bone, Archivist, Archives Branch, Library and Archives Canada, in September 2018. Baril’s commentaries on his work, daily logs, autographed first day covers, philatelic souvenirs and treasures from the cutting room floor of Canadian Bank Note. (Fully open). Rough drafts, research notes, correspondence and photo prints used in Marler’s Admiral and Edward VII books, as well as much of Marler’s personal Admiral collection. (All philately-related materials fully open). Diverse records from across the philatelic activities of Verge, including exhibitions as participant, judge and commissioner, records of philatelic societies, other notable philatelists and personal correspondence. (Some access restrictions). A small collection of artwork, correspondence and souvenirs from the first woman to design Canadian postage stamps, includes original art used for some Maldives stamps. (Fully open). Records of Sutherland’s involvement in the philatelic community and societies. (Some access restrictions). Records of Kraemer’s work with the the RPSC and BNAPS, including coordinating publications such as Opusculum I , his own writing and research, personal correspondence. (Mostly open, some files currently closed). A massive collection of over 11,000 unemployment insurance stamps, mostly specimen precancels in large blocks and full panes, used and specimen unemployment insurance booklets and unique proofs and essays. (Fully open). A sampling of private first day covers from cachet makers Rosecraft, H&E, Caneco and Ginn from 1954-1974. (Fully open). Material retained from the October 1997 auction of the company archives including rare models, essays, die proofs, rejected designs, and much more for Canada and the BNA colonies. (Fully open). Newly available copies of the company’s ledgers on fulfillment of stamp orders, post cards and stationery. (Fully open). Records of this renowned graphic designer, including his work on stamp design and Canada Post souvenir collections in the 1980s. Features alternate designs for the 1983 and 1984 Canadian Forts series. (Not yet available for consultation). The links to the Library and Archives Canada website given below are to English pages; however, on any page, you can switch to the French version by clicking the link "Français" at the top right. Les liens aux pages web de Bibliothèque et Archives Canada mentionnés ci-bas vous dirigent à des pages en anglais. Cependant, sur n’importe quelle page, vous pouvez accéder la version française en cliquant le lien « Français » dans le coin supérieur droit de la page. To order material for on-site consultation, you must first register for a user card and then identify the material you wish to consult, preferably one to two weeks before your visit to Library and Archives Canada in Ottawa. The process for doing this is described on the following page on the LAC website. A summary of the process is given below. 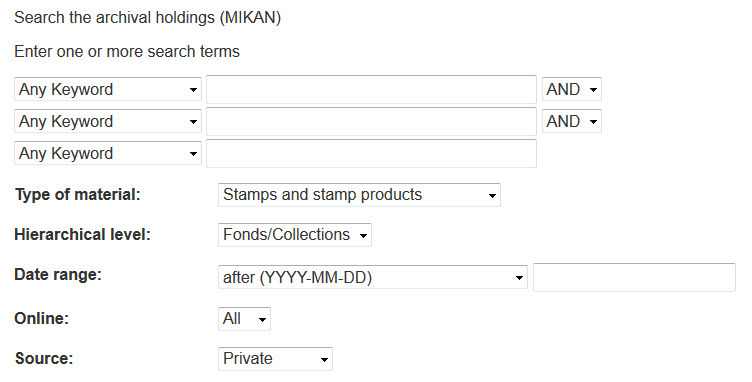 The following example shows how to fill in the form to search for philatelic fonds from private (as opposed to government) sources. In the illustration, no keywords are specified so all private philatelic fonds are listed. When the search was submitted on 14 November 2018, it produced 302 results. Among them are fonds of well known philatelists, some of them still active, stamp printers, stamp designers, collections of correspondence with covers from non-philatelic sources, etc. Use keywords to obtain results specific to your area of interest. 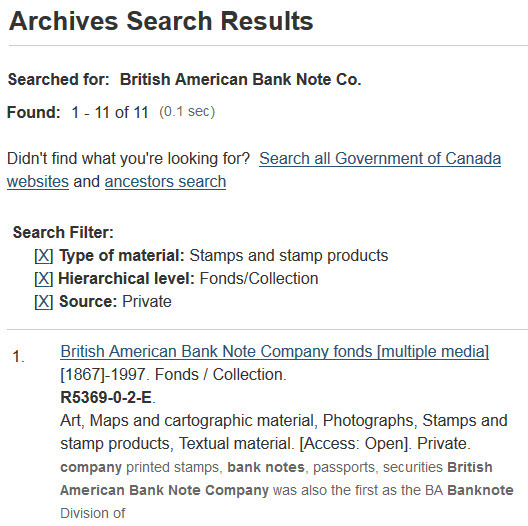 For example, setting a keyword to "British American Bank Note Co." produces 11 results, the first of which is the fonds of the printer as illustrated below. Clicking on the fonds title displays a page providing a detailed description of the fonds content and background information about the fonds' source.